Stokboard is made from recycled plastic and is one of the most durable, flexible and best value sheeting products on the market. 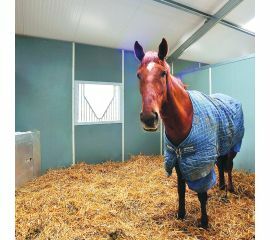 It’s an ideal alternative to plywood and provides a robust, maintenance free solution for your livestock and horses. Stokboard is chew-proof and rot resistant; ideal for use with livestock as it is unaffected by animal or water waste. It is versatile and sustainable, with no management or upkeep required. Stokboard prices vary depending on the size of sheet required. Stokboard is used throughout the farming and agricultural industry as it is suitable for use in sheep and pig pens, poultry housing, cattle handling races, sheeting gates, stable lining, feed trailer floors, grain stores and bins, lining troughs and multiple other applications. If you need assistance in selecting the best size of Stokboard for your project, or would like to find out more about Stokboard range, get in touch with the McVeigh Parker team on 03330 050115 or via our contact form.